After a few rumours began to spread through the internet, OPPO announced their successor to last year’s R1, the OPPO R1C. The R1C is a notable addition to OPPO’s lineup as it adds a great mid-range option with a very unique design feature – a sapphire back. Reports claim that the R1C will come in two variants, a blue one with a sapphire back and a regular device with no sapphire. Reports also claim that you can see your own reflection very clearly on the sapphire back which is pretty cool. The main attraction of the material choice is its incredible hardness which therefore makes it highly scratch resistant and also adds strength. 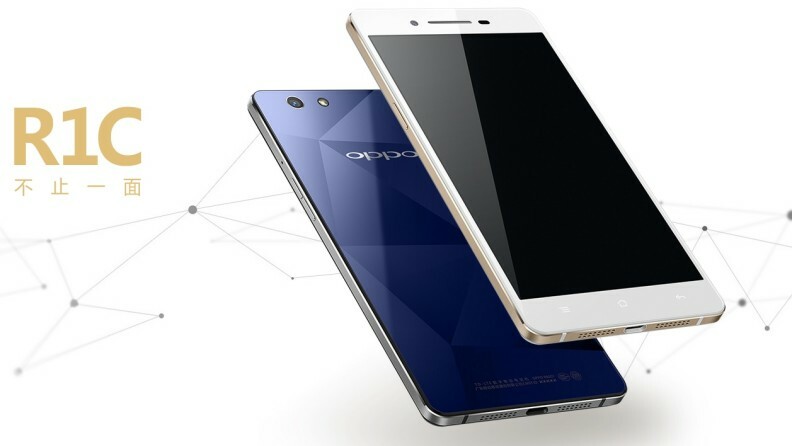 Sapphire has been of great interest to almost everyone observing the smartphone market, especially after Apple and the GT Technologies debacle and it is great to see the material being used by OPPO, a company which has always aspired to set new trends such as 1080p and 2K in smartphones. The R1C has great mid-range specifications. The device has a 5 inch 720p LTPS LCD display and is powered by Qualcomm’s Snapdragon 615 64-bit octa-core chip along with 2GB RAM and has 16GB of built in storage expandable to 128GB via microSD. The phone is also super thin at just 6.85mm and houses a 2420mAh battery. Color OS 2.0.1 runs the software show, based on Android 4.4 KitKat and is pretty as ever. On the back, the R1C sports a 13megapixel Sony Exmor RS IMX214 with F2.0 aperture and up front we have a 5megapixel camera which should be ideal for selfies. OPPO has always impressed with their camera tech and we expect nothing less from them here. As for the design, the pattern on the sapphire back looks very stylish and the build looks solid. We can see some resemblance with the OPPO R5 – which is not at all a bad thing. The R5 is built really well as demonstrated by some recent videos from the company, hence we hope with all our heart that the R1C carries over the same emphasis on strength and build quality. The device has support for two SIM cards, one nano and one micro and also supports 4G. The handset will release in China on the 20th of January and will retail for 2499 RMB (approximately $400) although we are still unsure if this is for the sapphire-less model or not. OPPO devices can usually be bought easily online so buyers from other markets need not worry.